grinning in the corner and being plied with drinks. as he introduced me and gave the man his offering. Our last one. It was years before I knew what that meant. perhaps milder, perhaps damper, I’m not sure. to where I was born or to take my sons to a Legion. The Royal Canadian Legion is a non-profit Canadian veterans organization founded in 1925. Almost every small town and village in Canada has a ‘Legion hall,’ a social club, attached bar and a display of war memorabilia collected from the members. Passchendaele was a long and bloody Allied campaign of World War I that took place near the city of Ypres, in Belgium and was a classic battle of the western front of that war: mud, trenches, gas attacks, “up and over” the wire, no mans land, large numbers of men charging head on into machine gun fire, incredible kill rates…total estimates are a half million lives lost. It started in July of 1917 and ended ignominiously in November of the same year, failing to meet any of its strategic goals. Its value or waste as part of that war is still disputed, but one thing is clear: the horrific experience nearly consumed the entire contingent of many Canadian regiments and the Royal Newfoundland Regiment—where the old man of this poem served—in particular. 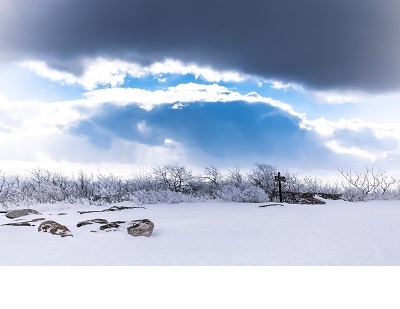 The photograph was taken at the top of Mount Wachussetts, in Massachussetts at the end of a particularly cold November, 2014. The memory of meeting that old man has been kicking its way into being a poem for some time, but it took 2014, the 100th anniversary of the start of World War I, to bring it forth. To see my photography blog, please visit the Book of Bokeh. Photograph, poem and notes © 2014 by John Etheridge; all rights reserved. The poem and accompanying notes are licensed under the Creative Commons Attribution-Noncommercial-No Derivative Works 3.0 Unported License. This applies to all original written work found on this site, unless noted otherwise. The attribution claimed under the license is: © 2014 by John Etheridge, https://bookofpain.wordpress.com. The photograph is not licensed for use in any way without the expressed consent of its creator. Wonderful piece, John. Love poetic storytelling like this. I’m glad you wrote this memory into poem being, John. It is so very fine. Bonnie, from you I will take that as an especial compliment! Thank you so much for being so gracious. When you read your own poetry, do you (as say, opposed to someone else’s poetry) have the inability to judge it? I can read someone else’s poetry and generally instantly understand my reaction to it, understand what parts and why I like it or not. But with my own work, as much as I think that it is ready to be posted and that I have a sense of finality (for at least the moment 🙂 ) I never have the ability to say to myself (until at least years after it is done) whether I think it is ‘good’ or not. And I’m not sure if that is a good thing or not. I know just what you mean, John. We write something and want to publish it right away… because Word Press makes this so easy and because there’s always “Update.” Shirley Povich, a sports journalist, wrote, ” I write what I want to read.” Key is “what I want” …and the scary fun of it. Smiles. “I write what I want to read.” Hmmm, that explains the poem, “You just won $20,000,000” that I keep re-writing!!! 🙂 But seriously, I am glad that it is not just me. No, not just you. Persevere in having fun, for at heart it is that and worth doing. John, again, I read something different than your other writings that I have read. This piece welcomes me, ironically, with this … in the beginning lines: “I remember those cold, comforting Novembers, / the way the damp hung in the air and soaked into you …” Your final words leave the reader with something powerful: a committment? Maybe a powerful tension within relationship and family? T, I’ll admit to you that I was pretty conflicted when I wrote this. I did not have a point I was driving to or a specific thing to say but was more bringing up childhood memories and reacting to them. I can tell you this: memories of Newfoundland’s often harsh and long winter and my love of it as a child and my dislike of it now are curious to me. (I much prefer New England.) I have an incredible amount of respect and gratitude for the men and women who have served in times of war…that is not an easy thing to have done for so many reasons and on so many levels. And it is thanks to them that I did not have to do it. Another theme: I despise alcohol. I do not drink, but that’s a religious thing, and I do not despise alcohol on that principle; I despise it because of what I have seen it do. I am not a prude and I do not mind being with anyone who is having a drink or two, that is their life, live and let live. But I cannot stand drunks and the perpetually drunk for what they do to themselves and their families. Coming from a working class Irish/English background you can imagine how much exposure to it I have had. I am at the library. My computer has a comment bug. My mother is a poet and I am a scientist. In 2012, when I started this blog I forced myself to try to comment on poems. It is intimidating. You are an outside person, in the quiet. Your photograph tells me that you are very comfortable waiting for just such a beautiful moment. The men in those halls are seeking a dark cave to disappear in. Ageing in their beers. “You are an outside person, in the quiet.” No one has ever said that to me before and when I read it first, it almost hurt. But then I realized that was because it is so true. And the more I thought it through, the more I embraced it and felt it resonate and settle peacefully in me. Thank you so very much! As I was telling another commentator, I wasn’t perfectly sure what this poem was about, but could feel tides surging through it. You nailed the rip tide. June, you are always so supportive. Thank you!